Hurrah for the return of The Amazing Race. Due to my ineptitude at reading the TV Guide I forgot to watch episode 1 last week, but lucky for me, there was the obligatory "previously on The Amazing Race" at the start of this week. If you're new to TAR here's a few hints for getting into the program. 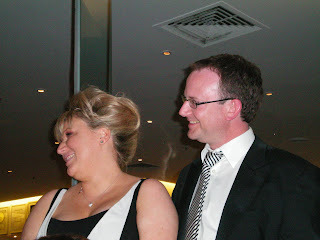 Firstly, don't try and learn all the couples' names in the early stages. There's too many and you'll get them confused. Although this time, there are some with distinguishing features - the short, stuntmen brothers, the asian american siblings, the mother and son (who is deaf), the blonde flight attendants, the hokey yokels (who sadly were eliminated this evening), and Mike White from School of Rock and his father. That's all I can remember at the moment, but I'm sure as they gradually whittle them down I'll start to have some favourites. Tonight TAR began in Switzerland and moved to Germany and Austria. There were all manner of AMAZING RACE-LIKE challenges, involving running, driving, running, parasailing, running, driving, seguing (yes I invented a word there), cherry pie in the face throwing, running, driving, arguing, mapreading, borrowing mobile phones from extremely obliging swiss taxi drivers, trying to open a castle gate and failing (mike white I'm looking at you! ), landing on the pit stop in front of Phil and a welcoming Salzburgian young man in fancy dress Mozart style. Oh...and the compulsory crying, without which no so-called reality TV program can be complete. It's the morning after the night of the United States of Tara. It's very difficult to come up with a decisive assessment on the series after only half an hour but hey, let's give it a go. I'll get straight to the point. There's one reason to watch the program and that's Toni Collette. The script clearly offers her the opportunity to present a tour de force in character acting with the various alter egos of Tara. Last night we were introduced to two of them - "T" - the irresponsible teenager and "Buck" - the Vietnam veteran. And there was one moment that will make me return to watch again next week. Tara finds her daughter having trouble with her boyfriend outside her school. Tara gets back in the car and transforms into Buck. It was subtle yet overpowering. I very much doubt that "Our Nicole" or even "Our Cate" could have pulled this scene off with such success. Too often with character pieces you can "see the acting". For I think there is a difference between inhabiting a character and actually becoming a character. And in that short scene I saw Tara become Buck. I didn't see Toni Collette "getting into character". I've always thought Collette has been short changed in terms of critical acclaim. Is it because her big break was a comedy? (which when I think about wasn't actually so much funny as tragic). If so, that's silly. She was absolutely devastating in Japanese Story. Take that Ms Kidman and your false nose. Enough of my waffle. The other reason to watch so far is John Corbett(i.e. Chris-in-the-Morning from Northern Exposure) as Tara's husband. I'll watch him in anything. Even My Big Fat Greek Wedding...and that's saying something. Stay tuned for more opinionated posting after next week's episode. 1. Having my eyebrows waxed before work. Ouch. 2. Feeling weary with the week. 3. Having to lug my dvd recorder to work so the nice people from Australian Air Express can transport it to Sydney under warranty because the stupid disk tray has cracked up only a couple of months after I bought it. This is annoying for two reasons. One, because I can't remember how to plug in my old player and realised I am too lazy to bother fiddle-faddling with it so won't be watching any dvds until I get this one back (10-14 days apparently). As we have established before, I am extremely non-technical. 2. IT'S ONLY A COUPLE OF MONTHS OLD! Judging by this post "W" also stands for whinging. For everything else...there's coffee before work. Earrings. I had a long debate with myself over which pair of silver earrings to wear - the big swirly ones or the hoops and then in my haste to leave the house earlier than normal (because I had to go to Woolworths on the way to buy soups for lunch because there was no food in the house on account of going away on the weekend, thus missing grocery buying Saturday) I forgot to put on either pair. Berocca: For the same reason as above. Usually I put the berocca in a glass of water and it fizzes away by the time I have washed up the breakfast dishes. However, this morning, because I was in a hurry to leave the house to get the soup for my lunch and be at uni in time for lecture first up I thought, bugger the breakfast dishes and therefore...ta da...no berocca. But you know what...microwave soups in a bowl were 2 for five dollars on special when I got to Woolies. Dare I say bargain? Guess who's having soup everyday this week for lunch? "Didn't we have a luverly time, the day we went to Jimbour....."
Every two years the Queensland Music Festival sponsors Opera at Jimbour House. Our rellies in Brisbane have been raving about it for a few years so this year the Davis clan made the trip from Bundaberg to Jimbour (a dot on the map outside Dalby) to join in the fun. The attractions this year were the Noonan family, Barry Otto as compere and Guy Noble conducting the Brisbane Philharmonic Orchestra. So, being an event called "Opera at Jimbour House" I was sort of expecting there to be more opera and less say, "singles from my next album" and ABBA. Not being a fan of Katie Noonan or george, the band she and brother Tyrone formed, I could have done with less of their jazz, classic, pop fusion in spite of her very pretty voice, and their songwriting skills. In terms of opera we got opera-lite - the letter duet from the Marriage of Figaro, the famous Lakme duet by Delibes, and then Nella Fantasia and Time to Say Goodbye which are essentially pop songs sung in Italian. Nice, but nothing to write home about. Andrea Bocelli and Sarah Brightman are the ones to listen hear. Mother Maggie Noonan clearly has a well trained opera voice but is perhaps past the age at which she should be singing Madame Butterfly and I felt she was a bit "pitchy" (as we say in the trade) at times and the top register a little thin. Father Brian clearly could sing well once, but as Barry Otto kindly explained, he has been suffering ill-health. Indeed, he seemed very debilitated and while it was obviously nice for them to all sing together on stage, this wasn't really what I had expected to hear. The orchestra however, was very professional and their medley from West Side Story which started the second half was lovely. 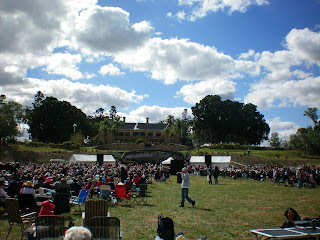 Still, it was a beautiful venue for an outdoor concert, the weather was sunny and quite warm. Thank goodness I took my hat. We ate strawberries, carrot cake and drank cups of tea. There were plenty of people indulging in wine. They might have been sorry when they left and the breathalysers were on the prowl on the highway back into Dalby. Apologies I missed your visit today. Please be assured that I was not inside peering through the venetian blinds in breathless silence waiting for you to turn on your heel and leave. I was in fact at work. However, please imagine my delight when I opened my front door only to trip over one of your colourful flyers, cheerfully inquiring "How can you survive the end of the world?". Congrats on the attention getting copy that's for sure. Less plaudits for shoving it uninvited under my front door. Sadly, I must take this opportunity to politely inform you that the end of the world is low on my list of worries at the moment. Furthermore, a flyer "warmly inviting me to come and listen to the answer" at the Boondall Entertainment Centre does little to entice me to attend, or indeed add "the end of the world" to my priorities. The lesson is, when next you visit my little house save your paper. A flyer of any kind, no matter how apocalyptic in its tone and discourse will not persuade me to suddenly see your light. Let's live and let live. How about that? Have you watched any of the following programs and enjoyed them? If so, then Glee might just be the television series you have been waiting for. Did you spend every lunch hour during high school involved in a cultural activity - choir, musical, play, orchestra, concert band, string ensemble, just hanging out in the music block for fun? Did you play no sport at all through high school? Were you in the nerdy,dorky, smart clique as opposed to the netballing, footballing, cricketing crowd where all the girls had blonde hair and perfect teeth and the guys didn't tuck their shirts in, and all wore cool three white stripe adidas sneakers instead of the regulation black leather shoes? (yes, I'm generalising and stereotyping. Yes, I know that's naughty). Do you love musicals, particularly the all singing, dancing numbers? If so, then I think like me, you might have enjoyed Glee. You might even be waiting in great anticipation for September when the series begins properly. You might even be prepared to suffer through yet another wailing series of Australian Idol where no doubt every ad break will contain an obligatory Glee promo to the point where you wonder whether you can maintain the will to live until September. So despite the fact that it is a slightly uneven tonal mix of the shows I have named above, I am prepared to wait patiently until Channel Ten deigns to show more episodes. And when it slowly loses in the ratings and is swiftly relegated to a late night slot (a distinct possibility although I am happy to be proven wrong) I will most likely continue to record and watch at my leisure. Damn you New Tricks and your season finale,leaving us hanging out to dry with Brian's emerging drinking problem which in the last minute was discovered by his ever patient wife Esther and his son (who I don't think we have seen before but nevermind). A lovely final episode all tied with with an investigation into an army officer's death many years ago, government secret drug testing, MI5, the rules of Jehovah Witnesses, Gulf War syndrome, and so on and so forth. Jack and Jerry took somewhat of a backseat to the wonderful character of Brian and his struggle with alcohol as well as his intuitive brilliance that led them to the murderer. I've said it before, but Alun Armstrong is an absolute delight as Brian. Next week, Australian drama East of Everything which is chock a block full of fine Australian acting talent (Richard Roxburgh, Susie Porter etc) but bored me to tears the first time it screened. A poor person's Seachange really, which was a classic moment in Australian TV and doesn't need emulating. Ever. I'm pretty sure I tweeted this but don't think I linked to it here on Spiralling Shape. So here it is, a journal article that was nearly 2 years in appearing from the time of submission to online publication. Truly I can barely remember writing it, and can't be bothered reading it again myself, but perhaps there's people out there who prefer this to my tales of naughty cats. Or not....please yourselves. Spicks and Specks however, is what we might call "good old fashioned entertainment". Adam Hills is a modern day Daryl Somers or Bert Newton (and I mean that as the highest compliment). He's quick, witty, a little bit naughty but basically inoffensive. He lacks the smugness of contemporaries Rove and Wil Anderson. That's a good thing. Rather, like Peter Berner on the Einstein Factor, he is engaging. So who will join Adam, Myf and Alan on the panels this evening? Let's see shall we? (tap tap tap..wading through all the ABC self promotion that apparently is not classed as advertising). Oh and now a news update. Gordon Nuttall. No surprises there. Swine flu...predictable. Dog bites boy. Weather with Jenny. Apparently it's cold. Who knew? Gee they're really pushing that United State of Tara. Wondering if it's any good. Trial and Retribution..no thank you. And now, something about foxes in Tasmania. Feral Peril..good names always rhyme. Wonder what David and Margaret will make of old Harry and his mates. Oh, is Spicks and Specks actually starting. Thought we'd have at least three more "coming up soon on your ABCS"
Stripey suit Adam. Little joke. Cute. Ella Hooper. O-kay. And the comedian whose name I can never remember. Not a good sign. OOOHH Murray from the Wiggles. That's better. Dave O'Neil...well he's no Hamish Blake but he'll do. Some over laughing and then to round 1. Alan chooses blue eyed soul. Myf - yacht rock. I don't even know what that is. Everyone stuffs the Dusty Springfield question. How hard can it be people? Now for Yacht Rock. Adam is kindly explaining what it is with a visual gag. that's something new. Noice. Murray Wiggle certainly knows his yacht rock. The doobie bros, steely dan. It's all a mystery to me. Round 2: this is a slightly boring game. Match the thing with the question. Stay tuned for lots of team quibbling and attempts at joke making. YAY.. Myf's team got it right. Now Alan's turn. Something trivial about Jimi Hendrix. Go Alan and team. They're joking about Jimi being a girl's name. I went to primary school with a girl name Jimi. Never struck me til now that her parents might have been big Hendrix fans. Because when I was 10 I was completely unaware of Jimi Hendrix. Now chat time with Murray and the story of his invention of the famous Wiggles hand moves. Lame joke from Adam on the panel. Moving on nothing to see here. Follow up to one hit wonders or something now. I might be thick but I can never understand these better or worse questions. Thankyou Alan for clarifying. Hurrah ALan's team got it right. Myf team's turn now. The Knack vs A-Ha. I know I've heard that A-Ha song before, back when I was young and used to read Smash Hits magazine and stick pictures of Johnny Depp in my school diary. When he was in 21 Jump Street. Did I blog that out loud. Oh Well. Oh the keyboard game. This is stupid and an insult to pianists everywhere. Musical snobbery emerging now. I much prefer the bicycle riding game myself. Because that's not stupid at all! But good, Dave playing for Myf's team. He just manage to squeeze some entertainment out of this. Yes he's milking the moment with some Gilligan's Island references. As well as "taking the piss" out of the game as they say in the street (or wherever). Thank you Dave, perhaps they will relegate this game to the land of Never again! Right...this is going for far too long now. And now he's making a joke of a Paul Kelly song. Sacrilege quite frankly. Last song now and the horror will be over. Alan's doing the fake laughing, not a good sign either. Finally over. We must be up to the last round now. Surely....please Adam...please! The Final countdown: Good. Alan's team trouncing it now. But he's devastated getting the last one wrong. Not sure how Myf's team won actually. Ooh final song excellent: What Shall we do with a Drunken Sailor? Fabulous fiddle music though. And there's a banjo. BONUS. A rousing end to an ordinary episode of Spicks and Specks. Are you a slightly overweight smokey grey tabby? Are you bored at home while your servant is out slaving away to put salmon flavoured dine and sardine whiskas dry food in your dinner dish? Are you tiring of the delights of slowly ripping apart a paper bag? Do the two cardboard boxes your servant has kindly left inside for you to play in no longer do a whole lot for your day (despite the fact they detract from her interior decoration such as it is?) Are the silver and blue fake straw and baubly twigs in a vase that double as a Christmas tree just too tempting for words? 1. Lull your servant into a false sense of security by studiously ignoring said fake straw and baubly twigs for say, hmm, the last three to four months. She's stupid. She'll think you've forgotten about them and leave her bedroom door WIDE OPEN. 2. Climb up on to the top of the bookcase where she has placed aforementioned vase( where she believes it is out of cat's way). 3. Attack the straw and baubly twigs with all your kitty-cat might, wrastling them to the ground. 4. Be very careful (and this is the only reason you will be getting dinner tonight) not to knock the vase onto the floor. Leave it intact. 5. When your servant arrives home at the end of a long day, in a clever act of misdirection, be lying fast asleep on her bed in a cute and cuddly pose, so as she doesn't notice the mess on the floor immediately. 6. 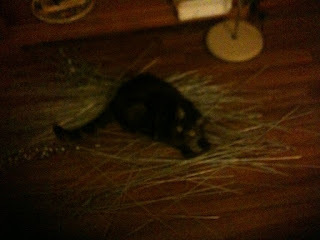 When she does (and this might take a few minutes because, let's face it she's a bit slow) and looks at you accusingly, jump down from the bed and wander over to the straw and baubly twigs in a bemused fashion, miaowing, as if to say, "now, how the dickens did this mess get here?". 7. You can also miaow in an affronted fashion when she dares to scold you and remove you from her bedroom. 8. As a final act of fun, when she goes back in to tidy up, make sure you loll all over the mess so it's really difficult for her to pick up all the sticks. Follow these instructions carefully, and a great day is guaranteed. Thanks to Andy for sharing this on facebook. It's cheered me and my cold up immensely (even though The Sound of Music is far (hahaha gettit) from my favourite musical). How fantastic. I might just spontaneously burst into song tomorrow surprising my unsuspecting work colleagues. What song to choose though? Perhaps Adelaide's Lament from Guys and Dolls? The problem with now having a DVD recorder is that now am continually have to catch up on my TV viewing because I record things that would normally miss. And then, I'm trying to fit them into my regularly scheduled programming. The Big Bang Theory - a guilty pleasure thank you Channel Nine. New Tricks - What's better than four old character actors plus Amanda Redman solving mysteries? Not much. Last week's highlight for me was Brian (Alun Armstrong) going undercover as Barry to catch a magician murderer (or something...the plot was all a bit confusing). Nevertheless, this distinction between Brian and Barry was that Barry had rheumatic knees. Nice. Torchwood from last Friday which I enjoyed A LOT. Atmospheric and gripping all the way through. It was a little contrast to last night's Torchwood with the Cyberwoman wreaking havoc all over the place. However, if nothing else it has reminded me that I could revisit Donna Haraway re the theory of the cyborg. Doctor Who from Monday set the scene for one of the episodes that scared me the most this coming Monday: The Satan Pit. Not really into Satan as storyline I have to say. But each to their own I guess. I probably tape and watch at a different time. In between I managed to keep watching Teachers (Tuesday ABC2) which is starting to lose its mojo now I'm guessing we're into Series 2. Can't be long til Andrew Lincoln leaves and it was all over red rover. Spicks and Specks was a surprisingly entertaining episode given the guests. I can't help myself. I find Hamish Blake really funny despite my better judgement. A number of episodes of Curb Your Enthusiasm. I particularly love Larry David's interactions with his "friends" Ted Danson and Mary Steenburgen playing themselves. And anything which guest stars John MacEnroe as himself has to be alright. John and Larry bonding over Larry's inappropriate birthday gift for Danson of a "book of freaks" was delightful. And last but not least, When the Boat Comes In. Way back in January I gave my parents an anniversary gift of Series One. They have only just started watching it. They save it for nights when I eat dinner with them. We've watched four episodes so far. Classic British drama with James Bolam looking young and dashing as a returned Sergeant, wooing Jessie Seton (played by his real life wife who appears as Brian's wife in New Tricks, alongside Bolam. It's complicated). It's all poverty, despair, strikes, miners, disease and cold. But for something made in 1975 it's aged remarkably well. If only my parents would stop saying things like "Isn't a shame so and so dies", or "they didn't get married did they?" it would be even better. The Young Ones Series 1 and 2 on DVD - 14.99 each. All in all I think I was very restrained. Above are some words to describe the wedding experience on Saturday. It was the coldest I have been for some time, standing outside in the shadows of the All Hallows Chapel with the wind whipping up off the Brisbane River. 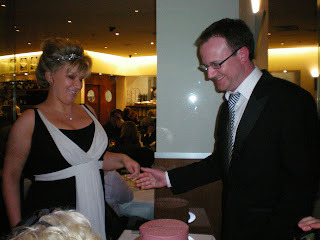 However, the close up view of the Story Bridge made up for it to a large degree, as of course did the joyful occasion of the marriage of my brother to his beautiful Kate. 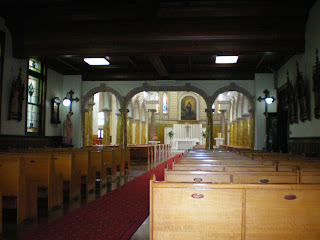 Not being Catholic I always find it fascinating to go into Catholic churches to see all the imagery and iconography. (is that the right word?). For instance, who knew there was some woman named Veronica in the Bible. Not me, but there at the church entrance was a painting of her and Jesus. Anyhoo, not to dwell on twiddling details, the string trio was lovely, especially when they sank into the Lakme duet during the signing of the official papers. Sheep may Safely Graze was an excellent choice for walking up the aisle as well. The internet sourced Franciscan friar spoke very nicely. It was a down to earth religious ceremony. He had authentic, well-worn sandals and a rope belt under his special wedding robes. And a very impressive beard. We're all hoping he's enjoying his Johnnie Walker thank you gift. It was over in a flash (although in real time 45 minutes) and then outside for all manner of combinations of photos. At one point the Davises (Davii?) were all set for a photo when a gust of wind blew right in our faces and we all screeched. That was fun. I'm hoping there's a shot of that somewhere. 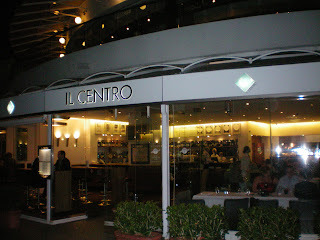 Then to Il Centro for the reception. The maitre'd thought I was a little bit strange when I chose the duck salad but hold the duck. The other choices were seafood of which I am not a fan. As you may gather I'm not a fan of duck either, and it seemed the easiest one to rearrange. They very kindly replaced my duck with extra rocket. 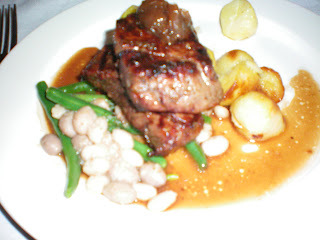 Rib fillet with the yummiest potatoes I have had for some time was the main, and then the Red Velvet Wedding Cake. 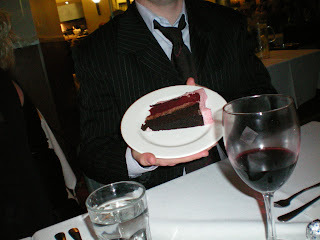 By this time I was (1) really full and (2) struggling with my all important undergarments, so wasn't able to finish the slice of cake. This was a shame because it was particularly delicious. Never mind, a good time was had by all, especially my Nana who loves a good party, and couldn't rave enough last night on the phone about how much she had enjoyed herself. She has told all her friends at the retirement village about my toeless stockings. Oh, yes, it's quite the topic of conversation out Sunnybank Hills way. I'm sure it'll be trending on twitter really soon. And then, suddenly it was all over. A new Mr and Mrs Davis have entered the world and are on their way to Japan. The cup of tea Keitha made Big J on Flight of the Conchords last night. It was a sight to behold (especially the use of the leftover cereal milk). If you missed it, you missed out in a big, funny, New Zealand kind of way. Parents, little sister and me. Those smiles are frozen in place. It was fantastically cold and windy. This is it you know. This is the meal. (and yummy it was too). Our friend who grew up with my brother and I in Bundaberg. She's on the left. I see her once every couple of years. We never keep in touch in between but whenever we see each other it's like no time has passed at all. That's me on the right. And that's all I can manage. I'm home, tired, in my pyjamas and going to read some stuff for work tomorrow while watching Marple and drinking tea. Details in a proper post very soon. 6. 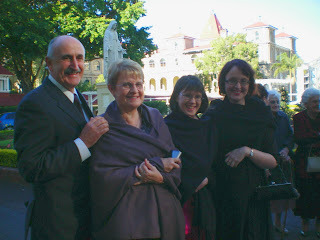 Extra black coat bought yesterday for the event of wraps failing to provide required warmth. 9. Pack Warm clothes for when not wearing seasonally inappropriate formal wear. 11. Mentally steel self for roadtrip with family and grandmother. Tales of the city to follow on Sunday evening. 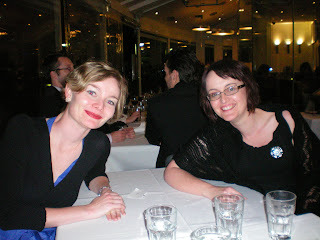 There may be photos if you are all very good. My name is ("name removed for privacy reasons") and I am a producer at TODAY - WEEKEND EDITION with the Nine Network. This weekend will be the 20th anniversary since Seinfeld debuted and I understand you are the press contact regarding this. I would love to chat to you about this as soon as possible. I am not, and never have been a press contact for anything, let alone the 20th anniversary of Seinfeld (although that sounds like a pretty fun job and one that I would like). I rang the producer back and explained this to her. Apparently my contacts appear on some events list that the media has access to saying that I am officially connected to the 20th anniversary of Seinfeld in some way. What a little bit of blogging leads to! I offered to send her my blog address. I think she was hoping for press releases. It was a bizarro moment in an otherwise very ordinary day. For a moment there, I was almost important.